Black North Carolinians are African Americans sampled in the state of North Carolina. Usually carrying about one-quarter white admixture, they also can have significant amounts of American Indian ancestry, particularly Cherokee, Saponi, Tuscarora, Lumbee and other. African American history dates from 1619 when the first slaves were brought to Jamestown. The Black – North Carolina population data represent DNA samples from 383 African-American individuals in the state of North Carolina. Samples were provided by the North Carolina State Bureau of Investigations. For more details on this population, see North Carolina. 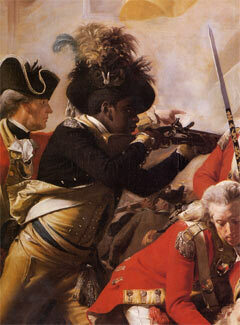 Photo: John Singleton Copley’s painting The Death of Major Peirson. Photo taken by Man vyi in 2012.